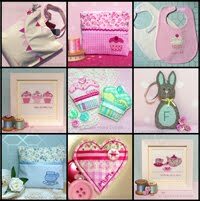 My online shop is now up and running. 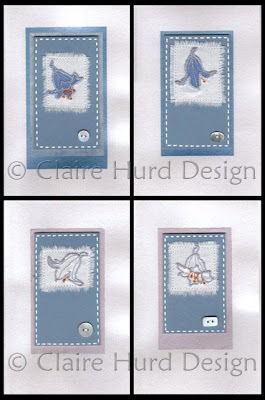 I shall continuously be adding new products so please keep popping by at http://folksy.com/shops/ClaireHurdDesign and I hope you will like what you see. I have made my first sale already and have positive feedback from the customer. It is great to know that my designs are being bought and enjoyed by others. Great news - I now have an online shop! 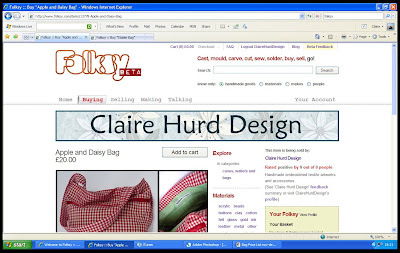 I have just opened a shop through Folksy and you will be able to find many of the items you have seen here on my blog in my shop. Please pop along and take a look at what I have available and see what you think - all feedback is welcome during these early stages so keep in touch. 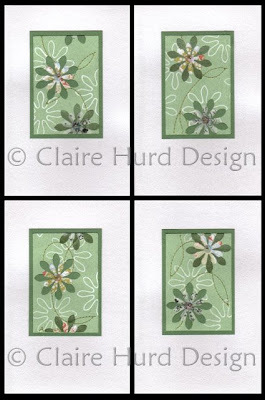 My previous commission for floral greetings cards for any occasion has led to another commission for more of the same. I am therefore filling all my free time with card making once again. I am making each design in small groups so that although each card remains individual I have a small amount of stock ready for any future requests. 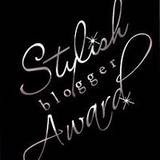 With the starting up of my online shop this year (keep your eyes peeled - coming soon!) I need to keep building up stock as I make things in the most time-efficient way I can. I am enjoying the challenge of making items in this way whilst still giving each product an individual touch to make it unique. The quality of my work and attention to detail is very important to me and I intend to maintain this in all that I produce. This morning I received the new Laura Ashley catalogue in the post and as usual it contains a wonderfully stylish mix of classic and contemporary designs. I was also really excited to see the extended Bella Butterfly range. 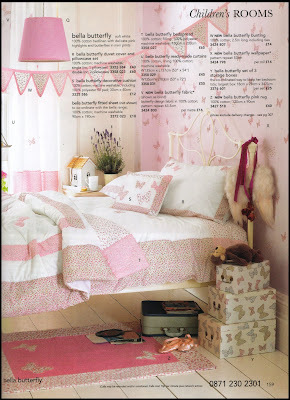 I designed this Girl's bedlinen range for Laura Ashley back in 2005 for a Spring/Summer 2006 launch and am thrilled that it continues to do well. Wallpaper, printed fabric and a rug have been added to the range this season and they look great alongside the existing products. Please visit www.lauraashley.com to see more of this range and the other beautiful children's designs they have available. Now that I have made all of my festive visits and passed on all of my gifts I am able to show you images of this floor cushion that I made for my brother. It is a 65x65cm cushion and has been made using corduroy and pre-washed wool base fabrics making it attractive yet robust. 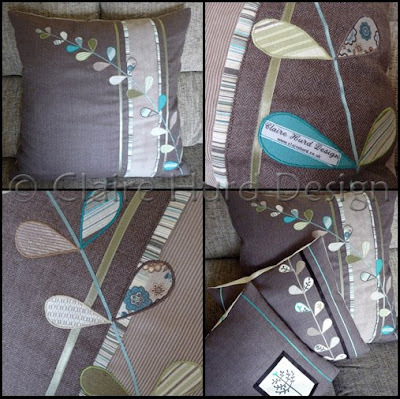 I really like this combination of green/teal/natural with brown and have used a stem appliqué design that co-ordinates with the smaller cushions I made for our house. 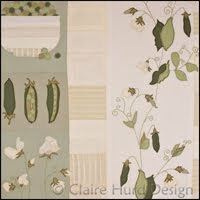 I am pleased with this mini 'collection' and look forward to developing it further producing handmade cushions for sale. I shall be setting up and online store this year so keep your eyes open for more details soon. 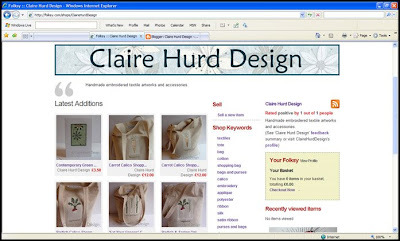 In the mean time simply email me at studio@clairehurd.co.uk if you would like to purchase anything you have seen on my blog or if you would like to commission me to make something for you personally.